...the city's median rent increased to $1,100 a month in 2011 from $950 in 2008, according to an analysis to be released Wednesday by the Community Service Society, an advocacy group for low-income New Yorkers. At the same time, as incomes flattened, tenants are handing over a larger portion of their pay to landlords than they did before the recession. The percentage of New York City households spending more than half their income on rent grew to 29% in 2011 from 26% in 2008, the report says. The report comes at a sensitive time: The city's Rent Guidelines Board is scheduled to vote Thursday on increases of anywhere from 1.75% to 6.75% for about one million rent-stabilized apartments throughout the city, a contentious annual event that can attract heated rhetoric from both sides. 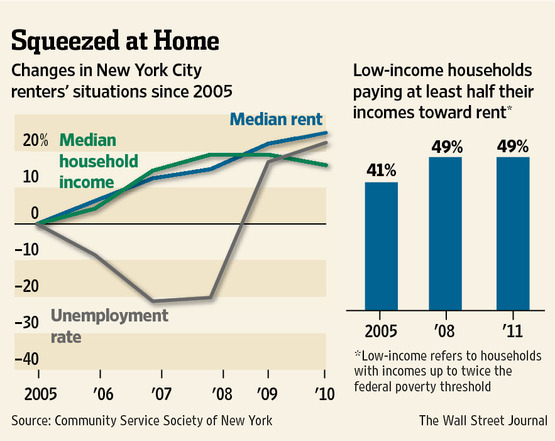 About a quarter of New York tenants live in rent-regulated apartments. Rent control has been a textbook example of the damaging effects of a price ceiling for years. When can we all just agree that it isn't working? Rent control leads land developers to under-invest in apartment buildings, and landlords to under-invest in maintenance and repair. Existing tenants benefit from lower rents but at the cost of creating shortages and worse conditions for everyone. "If you don't give owners the kind of cash flow they need in terms of operations, you're going to find that they're going to delay doing necessary repairs," said Joseph Strasburg, president of the Rent Stabilization Association, a landlord advocacy group. "You're going to have further deterioration of housing that hurts the owner, but in the end that's going to hurt tenants as well." Finding a good apartment becomes costlier due to wasted search time, and apartments end up being allocated through personal connections instead of going to those who value them most. This is one clear example of policy intended to help the poor which ends up making their situation worse. Translating the economic consensus into policy, and liberalizing the market for rental apartments in NYC, could have immediate and positive effects.